Can California Really Go 100 Percent Renewable Energy? UPDATE: The bill cleared both houses in the late summer of 2018 and Gov. Jerry Brown signed this legislation on Sept. 10, in the days leading up to his Global Climate Action Summit in San Francisco. The original analysis, below, is from Sept. 2017. California lawmakers are considering a groundbreaking new energy goal: getting 100 percent of the state’s electricity from clean sources like solar and wind -- in less than 30 years. For a state of California’s size, it’s an ambitious reach. California is second only to Texas in its energy appetite. As debate over the measure wore on in Sacramento this summer, another debate raged over the benefits and risks of going completely green, one that could shape California's future as well as other states. On one side: Mark Jacobson, a professor of civil and environmental engineering at Stanford University. To know where Jacobson is coming from, you only have to glimpse the license plates on his two electric cars. Jacobson has authored study after study on a 100 percent renewable future, including one focusing on California. 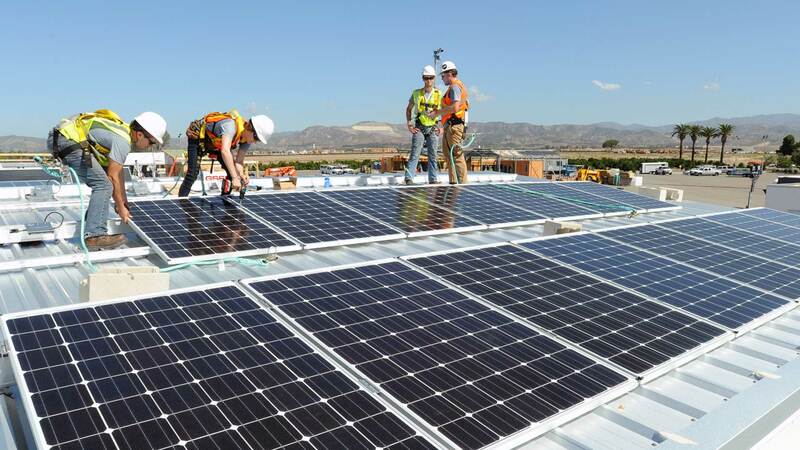 His work informed state lawmakers, when, earlier this year, they introduced SB 100, a bill that would set a goal of going all-renewable by 2045. Solar power is booming in the state, as electric utilities march toward the state’s existing goal of going 50 percent renewable by 2030. That’s already caused a few headaches. The sun and wind aren’t always producing power when Californians need it most, namely in the evening. And the state’s other power plants, like natural gas and nuclear, aren’t as flexible as they need to be to handle those ups and downs. Hydropower offers the most flexibility, but is scarce during drought years. The Desert Sunlight solar farm in Riverside County is one of the largest in California. Jacobson says there are plenty of strategies to overcome that. One is on display right in his garage: four large Tesla batteries mounted on the wall. The solar panels on his roof are charging them. “At night, when there’s no more sunlight, the batteries kick in and the electricity I use in my house is drawn from the batteries,” he says. California could do that on a massive scale, he says, either inside homes or buildings or by building very large energy storage projects. On top of that, a better-connected transmission grid could bring power into the state when solar or wind is lacking. And during times of peak demand, homes and buildings could reduce their power use dynamically through more advanced software and a "smarter" grid. “It’s going to be a huge deal because other states will be inspired, other countries can be inspired,” he says. Jacobson’s vision has drawn fire from critics. Earlier this summer, a number of scientists published a paper questioning his conclusions. “There’s a saying that academic squabbles are vicious because so little is a stake,” says Ken Caldeira, one of the co-authors on the paper and a scientist at the Carnegie Institution for Science at Stanford. In this case, there’s plenty at stake, and a ferocious Twitter debate ensued. California gets only about a quarter of its electricity from renewables today, so reaching 100 percent would be a wholesale transformation -- one that Caldeira fundamentally supports. “Each emission of carbon dioxide is another increment of warming and we need to have an energy system that doesn’t rely on using the sky as a waste dump,” he says. Caldeira says studies show reaching 80 percent renewable energy is well within reach. Even hitting 100 percent is technically possible. Costs are coming down for advanced batteries, which are still relatively pricey today. Renewable energy projects need new transmission lines, which can be challenging to build. Solar farms have a large footprint on the ground, which has already been contentious in California’s sensitive desert ecosystem. And the trade association for California's wind industry has said it sees little potential for new development here, after certain public lands were declared off limits. “I think the key is to start down that path and keep our options open," says Caldiera, "so when we get to the point where we don’t know what to do, hopefully by then we will know what to do." California lawmakers seem to agree. They rewrote the bill, changing it from a 100 percent renewable regulatory requirement to a 100 percent greenhouse gas-free energy goal. That means it could include nuclear energy, large hydropower dams, or even natural gas power plants, if they capture their carbon emissions. At least 60 percent of the electricity would still have to come from renewable sources. It was a welcome change for California’s electric utilities. SMUD has built a handful of energy storage demonstration projects. In mid-town Sacramento, more than 30 townhouses have both solar power and batteries. Sacramento’s utility hasn’t taken a position on the 100 percent clean energy bill. Pacific Gas & Electric currently opposes it unless changes are made, though when asked by KQED, the company refused to specify what changes it’s requesting. "We want to help California achieve its bold clean energy goals in a way that is affordable for our customers," the company said in a statement. "If it's not affordable, it's not sustainable." California lawmakers have until September 15 to vote on the bill and send it to Governor Jerry Brown.